Eugene Sukup, founder of Sukup Manufacturing Co., the world’s largest family-owned manufacturer of grain bins, dryers and other grain handling equipment, died July 12 following a brief hospital stay. He was 89. “Eugene will be remembered by his family and many friends, colleagues and members of the agricultural community as a leader, innovator and an exceptionally caring and generous person,” the family said in a statement. A visitation will be held from 3 to 8 p.m. Monday (July 16) at Trinity Lutheran Church in Hampton, with funeral services set for 10:30 a.m. Tuesday (July 17) at the church. Burial will be at Sheffield cemetery following the service. 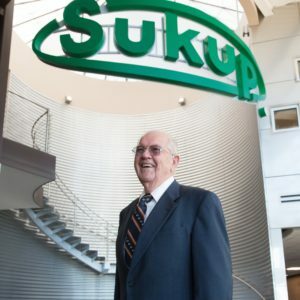 Sukup Manufacturing, based at Sheffield in north central Iowa, was founded by Gene and wife Mary in 1963. He served as president for 32 years before his son, Charles, was named president in 1995. Another son, Steve, is the company’s chief financial officer. Mary is the company’s corporate secretary. Gene still served as chairman of the board upon his death. Gene and Mary were married 66 years. A third generation of the Sukup family is also active in working for and helping lead the company. Steve’s daughter, Emily Schmitt, has a law degree and is general counsel for Sukup Manufacturing. In addition to her dad, she works with her husband, Andy Schmitt, her brother-in-law Matt Koch, and her uncle Charles who is the company’s CEO. Charles’ son, Andrew Sukup, also works for the company. The firm employs 600 people at its manufacturing facilities and offices in Sheffield, a town of about 1,200 residents. Sukup Manufacturing is one of the largest employers in north Iowa. Gene’s first patent was for grain stirring equipment he invented to prevent corn from spoiling when stored in a bin. Over the years he received approximately four dozen patents, many of them proudly framed and displayed in a conference room at the corporate office. In an interview in that office years ago, Gene told the editor of Wallaces Farmerhow he developed the idea for his first invention. Farming and raising hogs in the 1960s, Gene and Mary decided to build their first on-farm grain bin in 1963 to store shelled corn. Gene soon recognized the need to dry the grain in the bin. During that first year storing corn, he noticed some of the kernels on the grain surface at the top of the bin were gathering moisture and starting to sprout. Putting together an auger and an electric drill to power it, he invented a device to stir the top 6 inches or so of corn, to get it to dry and keep it from spoiling. Using a chain, he hung his invention from the top of the bin. It continually powered its way in a circle around the surface of the grain. Thus, the famed Sukup “grain stirrator” was born. Sukup founded his company making this device and eventually dryers and other accessories for bins and grain handling in 1963. 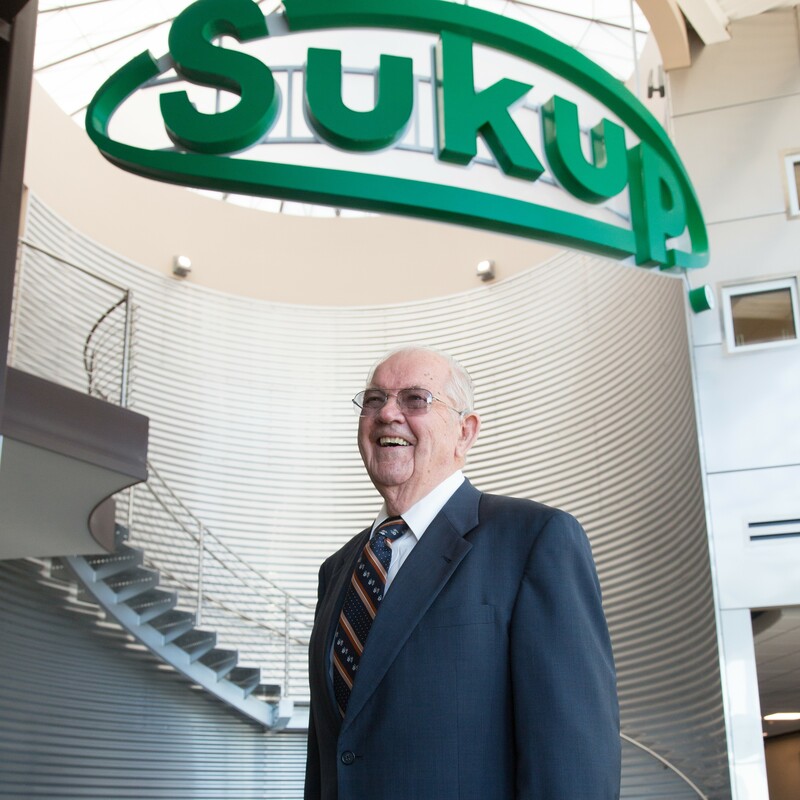 Sukup Manufacturing has grown to become the largest family-owned grain bin and grain system equipment company in the world. Sukup sold its first grain bin internationally in 2002. The company also manufactures and markets steel buildings for storage of farm equipment and other uses. That division is known as Sukup Steel Structures. Gene Sukup was inducted into the Iowa Inventor’s Hall of Fame in 2006. Sukup Manufacturing is known for its vision, taking care of its employees and giving back to the local community and to agriculture in unique ways, especially in areas of the world less fortunate than the U.S. The firm’s employees help supply the company with good ideas, say members of the family. The company founded a charity in 2010, Safe T Homes, following a devastating earthquake in Haiti. At the Sheffield plant, it modifies steel grain bins, producing a scaled-down version used as homes for people in areas of the world where disasters strike and people need homes. GoServ Global, a charity organization, raises money for the bins which Sukup provides at reduced cost to bring relief to families without homes in developing countries when disasters strike. The charity and Sukup provided 200 Safe T Homes in Haiti alone, and have provided homes in Africa and elsewhere. GoServ Global’s latest Safe T Home project in Peru is the Hidden Creeks Bible Camp.